Raspberry ketone is a natural substance that provides a powerful aroma to the red raspberries. This substance is also present in blackberries, kiwis, and cranberries in small amounts. Raspberry Ketone has been primarily used as a flavoring agent for several years. It is only recently that the anti-obesity properties of this substance have been proven. It helps in the management of obesity. It promotes a healthy weight loss through a variety of mechanisms. The molecular formula of Raspberry Ketone is C10H12O2. It appears as white needle-like crystals or granular crystalline material and has a sweet fruity odor that resembles a raspberry preserve. Raspberry Ketone is primarily used for weight loss. It possesses strong medicinal properties, which help in controlling appetite and stimulating the utilization of fats stored in the body. It is also used for the treatment of hyperpigmentation of the skin, and non-alcoholic steatohepatitis. Raspberry Ketone is a natural anti-obesity agent. It promotes weight loss by stimulating the fat burning processes. It supports lipolysis and helps in the faster utilization of fats in the body. It offers an effective and safe treatment for obesity. It works by supporting the natural metabolic processes of the body and results in a healthy weight loss. Hence, the use of Raspberry Ketone is highly recommended for losing weight. How Does Raspberry Ketone Work in obesity? Raspberry Ketone is an effective natural aid for weight loss. It works as an anti-obesity agent and helps people to lose weight in a healthy manner. The structure of Raspberry Ketone is similar to the structures of other compounds known to possess anti-obesity properties such as capsaicin and synephrine. Raspberry Ketone has the ability to alter the lipid metabolism and thereby, enhance the fat burning mechanisms in the body. This results in the rapid utilization of calories and prevents weight gain. It works by activating the lipid metabolism thereby resulting in the faster breakdown of fats in the food. It has been found to prevent the elevation in body weight even in the people who consume a high-fat diet. It prevents the deposition of fats in the abdomen thereby preventing central obesity. It also reduces the weight of the visceral adipose tissues in the epididymal, mesenteric, and retroperitoneal regions. It decreases the hepatic triacylglycerol content after the consumption of a high-fat diet. Raspberry Ketone increases the norepinephrine-induced lipolysis that is usually associated with the translocation of the hormone-sensitive lipase from the cytosol to the lipid droplets in the epididymal fat cells. These actions of Raspberry Ketone help to stimulate weight loss and prevent fatty liver. It has been found that this compound can also increase the glycerol release in the body, which serves as an indicator for lipolysis. Raspberry Ketone also suppresses the adipocyte differentiation. This helps to prevent the transformation of the precursor cells into the adipocytes. The action of Raspberry Ketone in altering the lipid metabolism was studied during research. During this study, the effect of this compound on obesity was evaluated in the experimental mice. The first group of mice was fed a high-fat diet along with a supplemental Raspberry Ketone for 10 weeks and the second group of mice was administered a high-fat diet for 6 weeks followed by the same high-fat diet along with Raspberry Ketone for the next 5 weeks. Hyperpigmentation of the skin is a symptom associated with several skin disorders including melasma and sunburns. Depending on the severity and the extent of hyperpigmentation, it can cause varying degrees of disfigurement. This can affect the appearance of the person. Over a period of time, it may even lead to the loss of self-confidence and self-esteem. Hence, it is important to treat hyperpigmentation with effective remedies. Raspberry Ketone has shown considerable promise as a skin lightening agent. It can help to lighten the dark patches of the skin and impart an even skin tone. How Does Raspberry Ketone Work in Hyperpigmentation of the Skin? Hyperpigmentation is a skin condition that occurs due to the excessive production of melanin resulting in the appearance of dark spots on the skin. Melasma is a common condition characterized by the hyperpigmentation of the skin in patches. It affects about 90% of pregnant women and is believed to occur as a result of the hormonal changes occurring in the body during this phase. Some other common examples of hyperpigmentation include age spots, freckles, liver spots, and sun spots. Hyperpigmentation causes the areas of the skin where an excess of the melanin pigment has been produced to appear darker than the surrounding skin. Raspberry Ketone can be used as a skin lightening agent to treat the hyperpigmented patches on the skin. It works by causing the inhibition of a process called melanogenesis thereby reducing the production of melanin. It inhibits melanogenesis through the post-transcriptional regulation of the tyrosinase gene expression. It results in the down-regulation of the cellular tyrosinase activity and a decline in the amount of tyrosinase protein. This helps to reduce the synthesis of melanin in the skin thus lightening the dark patches. The inhibition of Melanogenesis by Raspberry Ketone was investigated in a study in vitro in the cultivated murine B16 melanoma cells as well as in vivo in mice and zebrafish. The skin lightening properties of Raspberry Ketone have been confirmed during another research. 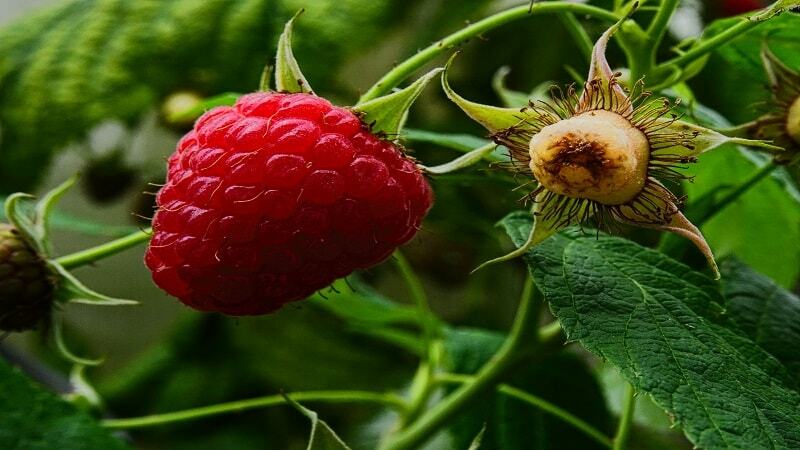 The study was conducted to evaluate and compare the effects of Raspberry Ketone and Rhododenol on the process of proliferation of the melanocytes. It was found that Raspberry Ketone could support the process through the reactive oxygen species-dependent stimulation of GADD45. Raspberry Ketone can help in the management of Non-alcoholic steatohepatitis. It is a condition affecting the liver. It occurs due to the inflammation of the liver that results in significant damage to the hepatic cells. It is caused as a result of the build-up of fat in this organ. Raspberry Ketone helps to treat this condition by regulating the fat metabolism. How Does Raspberry Ketone Work in Steatohepatitis? Raspberry Ketone helps to treat Non-alcoholic steatohepatitis by preventing the build-up of fats in the liver. It reduces damage to the liver and prevents the progress of this disease. It also acts as an anti-inflammatory agent and reduces the symptoms of this disease such as the pain in the upper right side of the abdomen and enlargement of the liver. It also regulates the fat metabolism and enhances the process of lipolysis. This helps to prevent the accumulation of excess fat in the liver. The hepatoprotective effect of Raspberry Ketone was evaluated using a high-fat-diet-induced Non-alcoholic Steatohepatitis model. The study involved administration of Raspberry Ketone to a group of Sprague–Dawley rats. At the end of the research, the blood lipid parameters of the rats such as total cholesterol, triglycerides, high-density lipoprotein cholesterol and low-density lipoprotein cholesterol were measured. The liver function parameters such as serum alanine aminotransferase, aspartate aminotransferase, alkaline phosphatase, and tumor necrosis factor α were also assessed. The topical use of Raspberry Ketone on the skin can help to delay the signs of aging. It can reduce the wrinkles and fine lines and improve the skin tone. It makes the skin firm and more elastic and prevents the skin folds. How Does Raspberry Ketone Work as an Anti-Aging agent? Raspberry Ketone helps to increase the elasticity of the skin and promotes the growth of hair by increasing the production of the insulin-like growth factor-I. It works by inducing activation of the sensory neurons. This helps to improve the skin tone and reduces the wrinkles and fine lines. Raspberry Ketone also helps to promote the hair growth. Hence, it is considered an effective natural remedy for treating hair fall.